China has been and remains the strongest leg of the economic recovery. While most other countries remain entangled in a weak recovery or no recovery at all, China’s economy appears to have surged back to its pre-crisis growth rates. But as the old saying goes, if it seems too good to be true it probably is. “China’s benchmark stock index may fall a further 17 per cent to 2,500 in the first half as the government steps up measures to cool growth, according to Guotai Junan Securities Co., the nation’s second-largest brokerage.The Shanghai Composite Index, which has declined 9.1 per cent this year, may extend losses on prospects for monetary tightening after consumer prices and fixed-asset investment climbed more than estimated, said Zhang Kun, a strategist at the Shanghai-based brokerage, in a telephone interview today. Despite being the strongest leg of the economic recovery, Chinese investors have turned remarkably cautious in recent months. The Shanghai Index peaked in July of 2009 and has traded down ever since. The index has declined 9.5% this year while U.S. investors have continued to run head first into stocks. 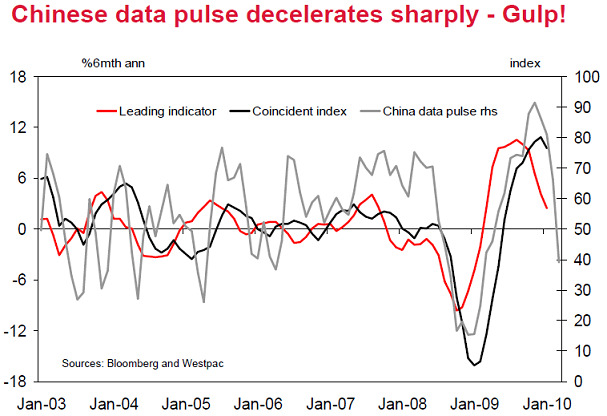 Interestingly though, the leading indicators in the U.S. are telling a similar story. 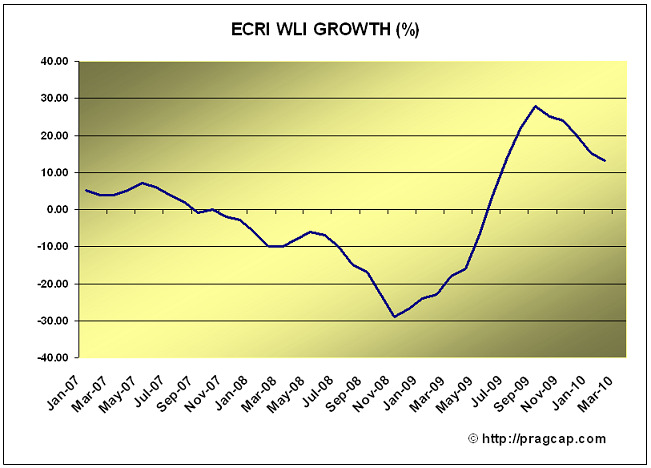 Friday’s reading from the ECRI continues to show a weakening recovery. Their leading indicator’s growth rate fell to a 31 week low. While China’s economy begins to show some warning signs, U.S. investors have signaled the all clear and are having a virtual free-for-all on the riskiest of risk assets. Curiously, the Chinese appear to be approaching the economic environment with substantially more prudence than their U.S. counterparts (much like their spending habits) despite continuing signs of private sector balance sheet weakness in the United States (you’d think it was the other way around!). China has proven to be a fairly consistent leading indicator over the last 18 months when it comes to the equity markets. U.S. investors could be wise to take note.